Wind and Thunder Gods of Sotatsu Tawaraya. Description: portrait illustration of Sotatsu Tawaraya. a Japanese painter in the early 17th century. The article talks about his notable work is Fujin Raijin-zu (Wind and Thunder Gods), and why/how this paint was sensational and became such an influential painting to Japanese art. 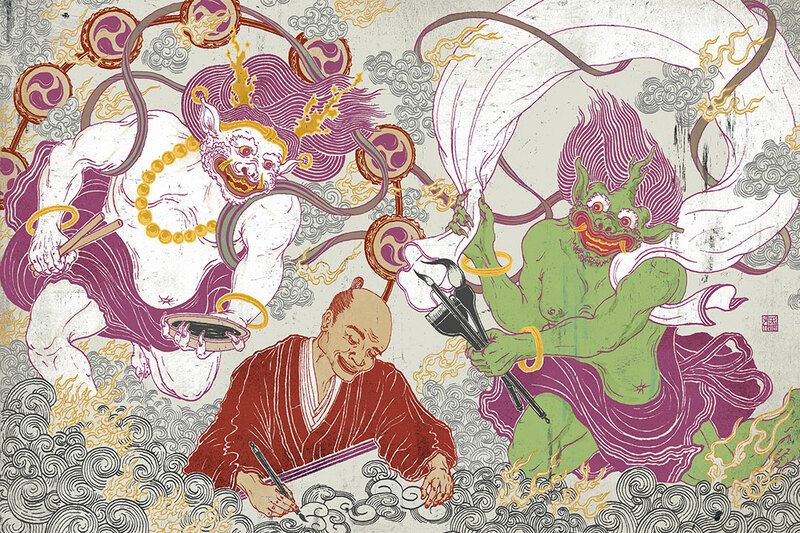 There have been many paintings and sculptures of the Gods, but Sotatsu illustrated the Gods in action and added human characteristics for the first time. I wanted the interaction between this painter and the elements to be energetic, innocent and exciting. It’s been a while I challenged myself to this neon colour, so I really enjoy the process on this particular piece!